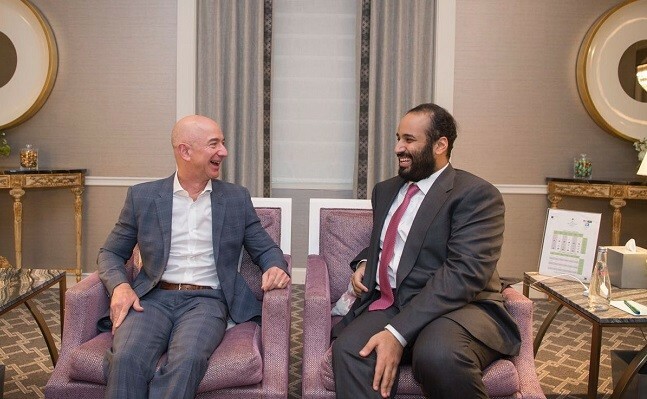 This 31 March 2018 SPA photo shows Jeff Bezos being chummy with the crown prince of Saudi Arabia, Mohammad bin Salman. Bezos is the boss of Amazon.com, notorious for its shabby treatment of workers, especially injured workers. Bezos is also the owner of the Washington Post daily. At the time of this photo, Bezos could not know yet that, very probably on the orders of his princely buddy, his Washington Post employee Jamal Khashoggi would be murdered most cruelly. Since that murder, Bezos has been remarkably very silent on it, CNBC in the USA says. Bezos did know at the time of the chummy photo that His Royal Highness Mohammad bin Salman was responsible for killing ten thousands of Yemeni civilians and threatening the lives of millions more by his famine warfare. Bezos seems to quite like wars, and making money from wars. So, apparently, he hates critics of, eg, George W Bush’s Iraq war. Jeff Bezos — the world’s richest person — is funding a massive Super PAC that claims to be non-ideological in their support of veteran candidates. Big problem with that, though. Right now that Bezos-backed Super PAC is running ads attacking Lauren Baer, a former State Department appointee and Democratic candidate running for Congress in Florida, outrageously questioning her love of country, after 9/11. And it uses all the same images and stereotypes the neoconservatives used to smear anyone who opposed the Iraq War. It is an absolutely dishonorable and shameful attack that has already resulted in one member of the Super PAC’s board resigning. The Super PAC’s name is With Honor. We want you to remember that. They are supporting more than a dozen Republican House candidates. With Trump in office, now is the time to pick sides. And using veterans to elect just enough Republicans to protect the Trump-led status quo is something we must reject. This entry was posted in Economic, social, trade union, etc., Peace and war and tagged Iraq, veterans by petrel41. Bookmark the permalink.